I must have been about 10 or 11 years old when our teacher decided our class needed to broaden its horizons. He arranged for each of us to correspond with an American pen friend. As a learning exercise it largely failed. My only lasting memory was amazed disbelief that my American counterpart thought kangaroos actually hopped down Australian streets. The wheel turns. 7 years ago I published a book, Habitat Garden*, about attracting wildlife to your garden. We tried to practice what I was preaching by growing endemic plants in our spacious backyard. In short the theory is that if you provide plants that help shelter, feed and house wildlife, then it will use it. Build it and they will come! Since then we’ve moved house, but only into a newer house in the backyard of the old house. Essentially that wildlife-attracting backyard has become our frontyard. And it has grown up to the point where the theory of planting for animal habitat has become an astonishing reality. I’m not just talking about possums here: there are few prizes for being able to attract those furry rogues to your garden. 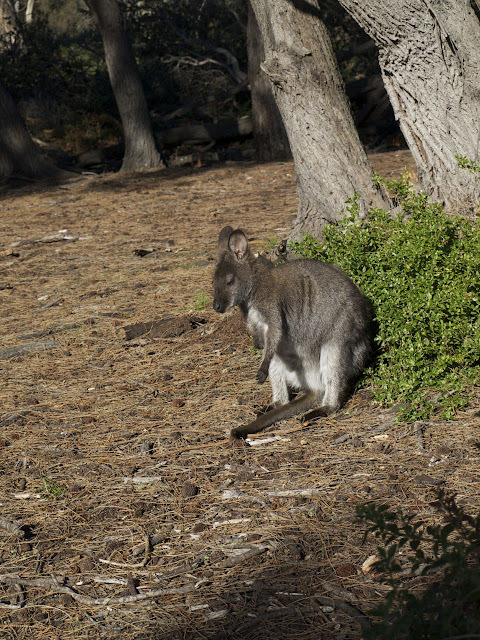 My astonishment is rather in finding evidence of at least three different macropod species in the garden. That’s right: kangaroos hopping down our street! Well, not strictly kangaroos, but their smaller macropod siblings. Potoroos, pademelons and Bennetts wallabies are all in evidence in both our garden and our nearby bushland. I did a double-take when I saw a Bennetts wallaby hop across the road in broad daylight a week or two ago. Yes, it is a bushy area, but it is still suburbia, and such things are only supposed to happen in the imaginations of foreigners! Then a couple of nights ago, I took our ageing dog for her evening wee-walk. I can normally keep her on the vocal chain – using voice commands rather than a lead. But as we walked into the dark she heard and saw something and twanged away like an arrow, despite my yells. I suspected she’d seen the neighbours’ cat and was simply continuing her long and fruitless conflict with Cheech. But a moment later a dark shadow bounced out of the gloom and almost ran into me. A pademelon! As shocked as me, it careered sideways, colliding with the mesh fence that stood between it and its favoured paddock. Bouncing off that it darted into the bush of our frontyard, the “habitat garden”, with Nuala the dog in hot pursuit. Thankfully the plant cover was thick enough for the pademelon to evade our dog. Or perhaps a canny “paddy” can always outrun an ageing quadruped. At any rate the dog came back to its astonished owner, and the pademelon leapt off to the safety of the nearby bush. As I put the dog inside for the night, I pondered on the privilege of learning the difference between theory and reality. We truly do share this place with other beings, some wilder than others. * ABC Gardening Australia Books, 2003. I believe it is now out of print, but the desperate could try eBay! I love our front/back yard! Eg. As we sat thus morning on the deck with our coffee a little Fantail came and rested on the railing cheekily chirping and waggling it's tail!